The great sweet-tart flavours of cranberries combine well with the salty bacon, crisp kale and creamy avocado. Make sure the dressing is very lemony as this will add lots of zing to the salad combo. Toss kale, cranberries and walnuts in a large bowl. Cook bacon in a pan over medium heat for 5 minutes, stirring regularly until crisp. Remove to drain on paper towels and when cool add to salad mixture. Cut avocados in half and remove the seeds. Scoop out the flesh into a bowl. Season with salt and pepper and coarsely mash with a fork. Spoon smashed avocado onto 4 serving plates. To make dressing, place lemon juice, mustard, poppy seeds, oil, salt and pepper in a small jar. Shake well to combine. Pour half the dressing over the salad mixture and toss well to coat. Drizzle remaining dressing over the dollops of avocado. 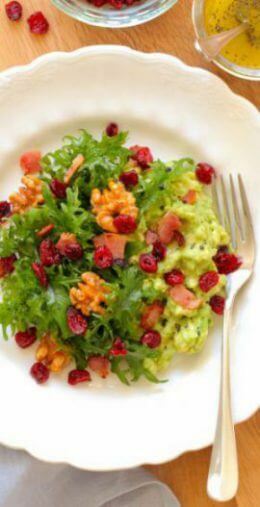 Scatter salad around the avocado and serve immediately. Tip: To toast the walnuts, place nuts in a small oven pan. Place in an oven heated to 180°C for 8-10 minutes, tossing once, until toasted golden brown. This recipe was created by Julie Le Clerc for Alison’s Pantry.